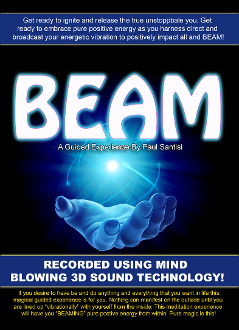 Recorded using MIND BLOWING 3D Sound! This is the listen anytime version. Meaning you can listen at work, at the gym, while driving, anywhere is perfect! We also have a DEEP RELAXATION version available on this site as well. If you desire to have be and do anything and everything that you want in life, this magical guided expereince is for you. Nothing can manifest out the outside until you lined up "vibrationlly" with yourself on the inside. This spectacular guided meditation experience will have you "BEAMING" pure positive energy from within. Pure magic is this! A true World Class Masterpiece full of intention and purpse towards the listener to create the life that they desire! You will smile, laugh, love, BEAM and feel terrific! This audio is wonderful and raise your energetic vibrations automatically!